Firstly there is no absolute right way or wrong way to go about packing and unpacking when you’re about to move house. What works as a strategy for you may not be any good at all for somebody else and vice versa. However, what many of us who have experienced a house move will have in common is that we’ll have all learned little tips along the way to make packing and moving out run a bit more smoothly or which has saved us time. Here are just a few ideas you will, no doubt, have many more of your own. All boxes need to be lifted so you should never fill any kind of box to contain more than 50lb in weight. It’s also better to pack heavier items at the bottom of the box. If boxes are not full, they can benefit from putting extra ballast inside to stop things moving around and so socks, scarves, pillow cases etc are ideal for this purpose and saves space too. 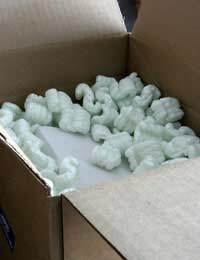 Don’t overpack a box and, if you have lots of smaller boxes, it’s quicker to move them out of the house if you put them into one much larger box. You should be able to close all boxes comfortably at which point they can be sealed so that they are flat. Depending on what they contain, don’t forget they may need to be marked ‘This Way Up’ or ‘Fragile’ and you should mark them anyway with what they contain and which room they are designated to go as then it will be easier to find everything and get unpacked at the other end. Once you have marked all of the boxes, by writing them down on a sheet of paper, you can use this as an inventory at the other end to ensure that all the boxes have been offloaded safely. You’ll be overwhelmed with boxes once you reach your destination but there will be boxes that can wait and others that will contain essential everyday items – kettle and tea bags springs to mind! Therefore, to make sure you can find essential items quickly, you should label these boxes “load last, unload first”. Hopefully, you’ll have packed boxes room by room and marked the boxes by the different rooms they’re intended to go. This will also speed up the whole unpacking process. You should draw up a plan of your new home and have marked out exactly where each piece of furniture or larger appliance is going to be put and give a copy to the removal men so that they’re not held up waiting to ask you where you want each item to be set down. There’s every likelihood that when you’re in the process of unpacking, you’ll encounter nuts and screws falling off items or some component separating from another on a particular item, not forgetting all the items you disassembled – fridge handles, PC pieces etc so you’re going to need a basic set of tools on you at all times. In fact, it’s often useful to wear a joiner’s belt as you’ll be called to bring your screwdriver every few minutes. In terms of reassembling items, it’ll have been a long day so, apart from getting the kettle on the go, make sure all the beds are at least assembled once you reach your new place. The rest of the reassembly can wait until the following day. You’ll probably have that many boxes to offload at the other end that the more hands on deck, the quicker the job will get done so enlist the help of your kids, if you have any, by drawing up separate lists for what each of them will be required to do. And, if you throw in some kind of ‘incentive’ such as a sliding scale of additional pocket money the quicker each of them can tick off their list or offer them a group incentive whereby they’ll get ‘such and such’ as a reward if all the lists are ticked off within X number of minutes, then you might be amazed at the speed of their help once you start to unload. In managing your time schedule, remember that it generally takes 3 to 4 times longer to pack a removal van than to unpack it. If you look upon packing and moving as a sort of ‘military option’ where everyone has a role to play and knows what’s expected of them, then the less stressful the event will be.